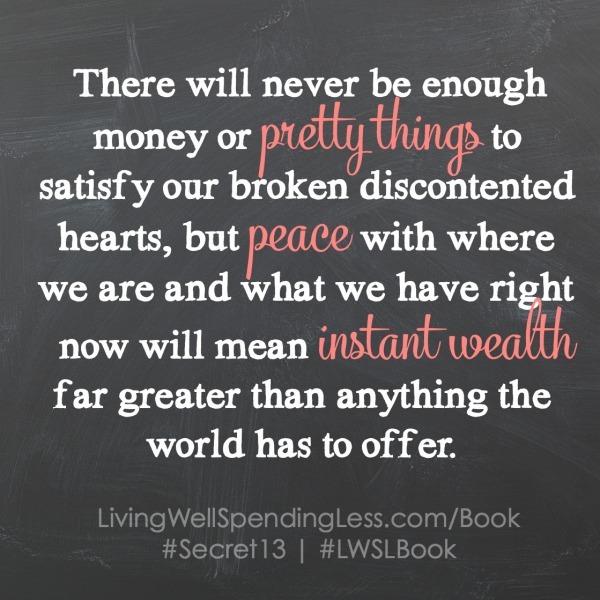 I have struggled with something my entire life: contentment. 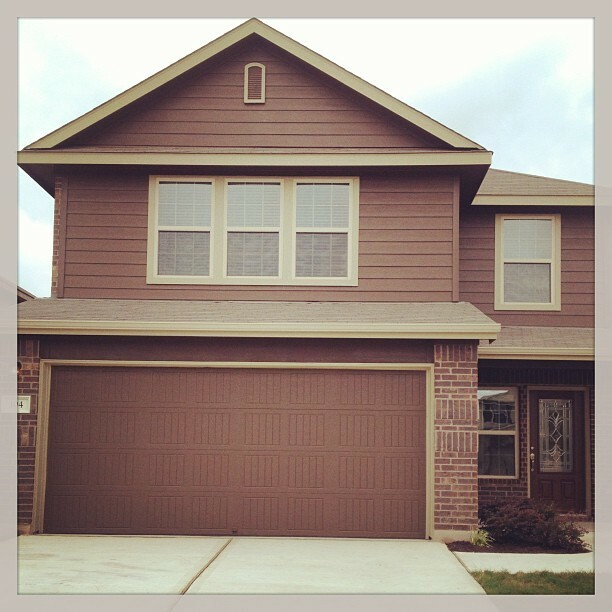 The grass is always greener in their yard over there, while I look at my grass that is green – but just not quite green enough. You know? I’ve struggled with contentment in material things, relationships, achievements, my blogging, my appearance – you name it. And it haunts me. I hate it. This is the number one thing I despise about myself and I’ve decided enough is enough. I have absolutely no reason to not be happy with where I’m at in life, what I’ve been blessed with materially and in my relationships. I have an attentive husband who loves me more than I deserve. I have 3 kids who continually amaze me everyday. I have a beautiful roof over my head. I have talents I know can be used to bless others with. And I am loved by a God who gives me grace. 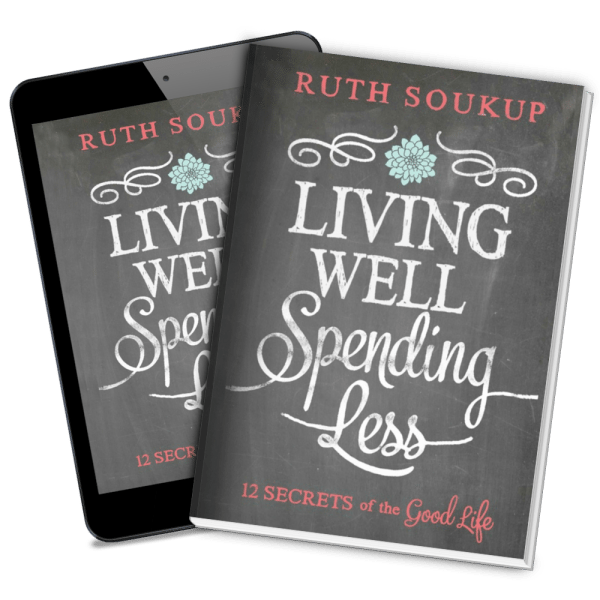 I recently read Ruth Soukup’s Living Well, Spending Less: 12 Secrets of the Good Life book, which launches TODAY (December 30th). 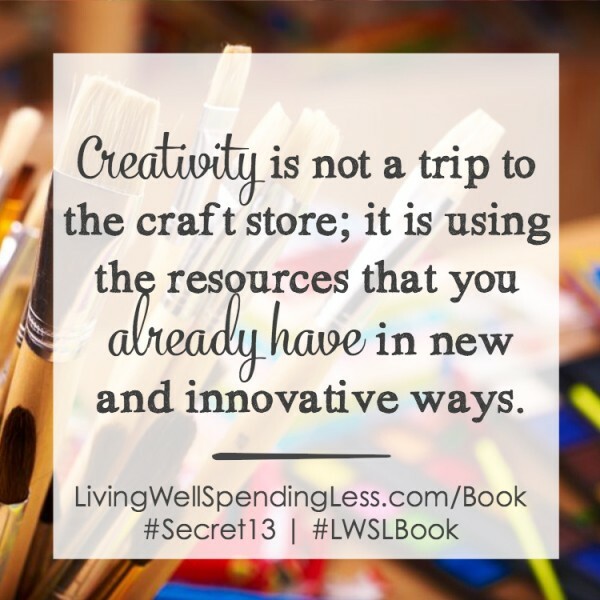 The entire book hit me right where I needed it to and was not only filled with practical resources such as saving money at the grocery store, but it was also filled with wisdom about writing down our goals, the fact that we all have a sweet spot and how contentment is a choice. Chapter 2 titled “Contentment is a Choice” stopped me dead in my tracks. I read the chapter 3 times. Who’s in control of how content I feel? My husband? My kids? The world around me? NO. I am in control of my contentment because….IT’S A CHOICE. Think about the people you most often compare yourself to. What is it about their life that makes you feel envious or inadequate? Would your life really be that much different if you had what they had? Now take it one step further: If you were to die tomorrow, what would you want to be remembered for? What do I want to be remembered for? 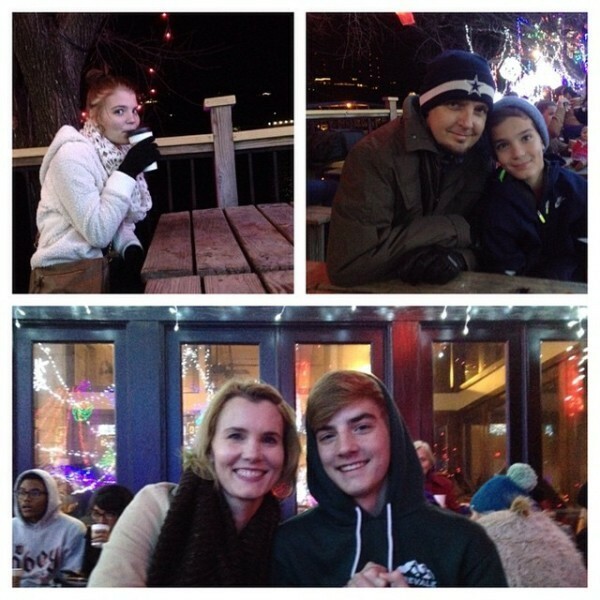 What do I want to hand down to my kids in terms of character, value and morals? And who will they learn about contentment from? 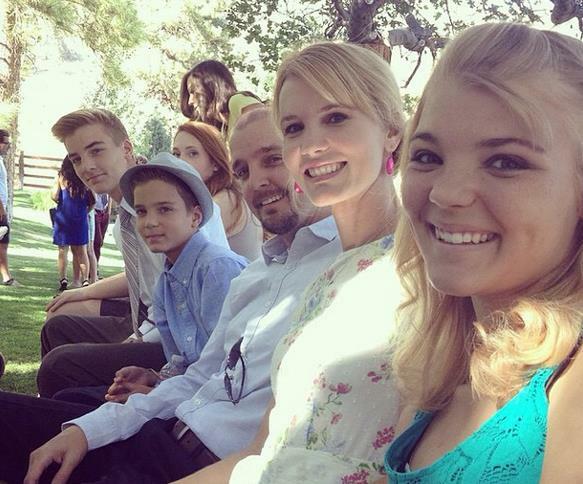 Their parents. I don’t want to be known for or remembered as someone who wasn’t ever quite happy with her circumstances. It sounds awful as I type it! I want to be known and remembered as a woman who was truly happy, joyful, thankful and content with her circumstances. Someone who took what she has been given and blessed others by it. Along with goals for the New Year, I also think of one word that I’ll focus on all year. For 2015 it’s CONTENTMENT. That’s my word. I was coming up with ways I can keep focused on contentment throughout the year and one way is to journal daily. Our pastor did a lesson this past Sunday titled “Spiritual Targets for 2015” and he talked about how to have a Healthy Faith, Family, Finances, Freedom and Future Leaders. When talking about a healthy faith, he said the one thing he would recommend is to JOURNAL DAILY over a scripture. For years I’ve started journaling and then stopped, but I’m convinced if I want to not only have a healthy faith, but healthy contentment too – I have to journal. So my word for 2015 is CONTENTMENT and my one thing I’ll focus on to help me succeed is to JOURNAL DAILY. Will you join me? Here are a few reasons I have every reason in the world to be one content and happy woman. 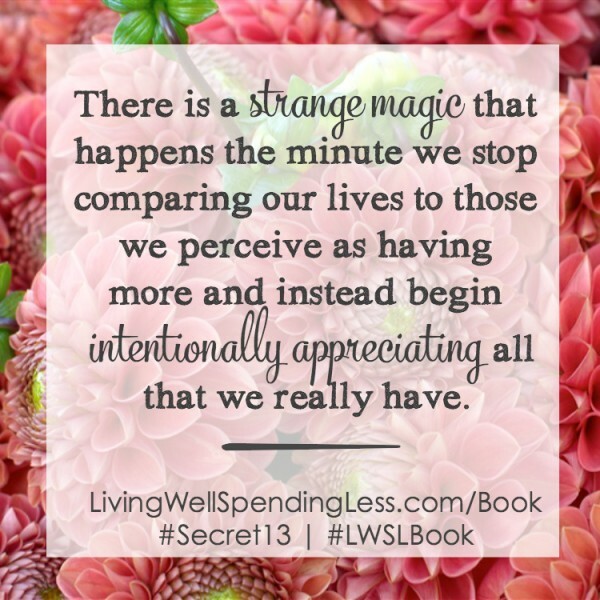 Discover your own secret of the Good Life in Ruth Soukup’s new book, Living Well Spending Less: 12 Secrets of the Good Life. Through personal stories and practical action plans, she will inspire you to make real and lasting changes to your personal goals, homes, and finance. It is real, honest, and speaks to the heart of the matter—how can you live the life you’ve always wanted? You’ve inspired us! What a wonderful post Julie.